Quality outdoor equipment will improve the recreation experience and we all know how expensive it can be. Specialized adaptive equipment can be even more expensive. 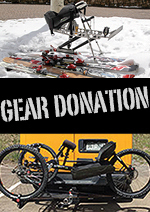 Every dollar donated here helps acquire adaptive equipment to help facilitate outdoor adventures for adaptive athletes and organizations. Choose an option to donate a set amount or use the Name Your Own feature. GoHawkeye is a recognized 501(c)3 non-profit organization and donations are tax deductible.